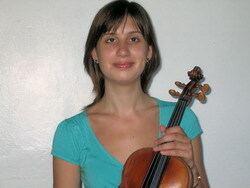 Rachel Sweet was born in the island of Jersey, where she began playing the violin at the age of 7. During her teenage years she developed a passion for the viola and became a full-time viola player when she began her undergraduate studies at the Royal Northern College of Music in Manchester in 2001, under the guidance of Professor Mark Knight. She graduated with a honours degree in Music in 2005 before completing a two-year postgraduate course where she earned her Postgraduate Certificate in Viola Performance as well as a Postgraduate Certificate in Secondary Education with Specialist String Teaching and a Certificate in Dalcroze Eurhythmics. Rachel has participated in a wide range of musical activities, working with a number of orchestras and chamber groups around Great Britain, as well as participating in the ‘Music In Hospitals’ scheme as part of a string duo. She has also been active in education, teaching violin, viola, double bass and classroom music in schools around Manchester and on the ‘Junior Strings Project’, providing accessible instrumental tuition for children aged 5-14 in the Greater Manchester area. Rachel also worked as a lead artist for the ‘Greater Manchester Music Action Zone’, helping 100 teenagers produce their own concert at the Bridgewater Hall, Manchester. In addition she has taught on a variety of projects including the ‘Manchester Junior Strings Project’ and ‘Lake District Summer Music’ courses, and as part of the Royal Northern College of Music’s award-winning chamber music festivals and instrument focus days. Here in Italy she has played in the ‘Cantiere Internazionale D’Arte di Montepulciano’ (as part of the orchestra-in-residence), in the Festival Orchestra for the ‘Festival Internazionale delle Orchestre Giovanili Europee’ and with the Orchestra da Camera Fiorentina. In January 2008 Rachel moved to Florence where she combines her musical life with teaching English, and these two enthusiasms come together in the ‘English for Musicians’ course here at ISTITUTO EUROPEO. She gained her TEFL International TESOL Certificate from The Learning Center of Tuscany and now works for Associazione Sunrise in Florence, teaching English to children and adults of all levels and abilities, as well as implementing a program of music courses.